On a sunny afternoon in August, Marcia Victor da Silva Acquino climbs a steep staircase to Ladeira dos Tabajaras. The favela is built across a mountain face stretching from Copacabana to Botafogo, hovering above Rio de Janeiro’s most famous beaches. Even in winter the midday sun is parching. But Marcia’s ascent is shielded from the heat by the surrounding foliage, casting cool shadows over her path. As she makes her way up the damp stone steps, the noise of traffic below recedes. Tabajaras is one of Rio de Janeiro’s thousand favelas – urban slums often built vertically along the city’s mountains. In the valley below, the busy streets of Copacabana, one of Rio’s most expensive neighborhoods, stretch out to the ocean. Locals sunbathe while children splash carelessly in the shallows, their joyous shrieks smothered by the crashing tide. Tourists, sun-screened and shirtless, sleep in the sand or amble along Atlantic Avenue. Past the beach, street after street is lined with expensive restaurants, fancy hotels, and pricey boutiques. Men in orange jumpsuits sweep the streets as throngs of pedestrians stampede by, outpaced only by the bustling traffic. A mere five-minute walk away, the busy scene gives way to a different side of the city. Leading up to Tabajaras, the road curves and steepens, and the architecture of luxury condominiums abruptly turns to red brick, crude mortar, and corrugated metal. Graffitied concrete walls guard the residences beyond with rusty barbed wire or broken glass. Narrow staircases cut haphazardly through the dense thicket of buildings, connecting the houses above to the community’s main commercial artery. Marcia lives off the main thoroughfare, in a dim two-bedroom apartment with her husband and their eight year-old son. The white walls reflect the glare of the small fluorescent bulb hanging from the ceiling in the living room. The adjacent room is the kitchen, equipped with a fridge, small stovetop, and a metal sink. 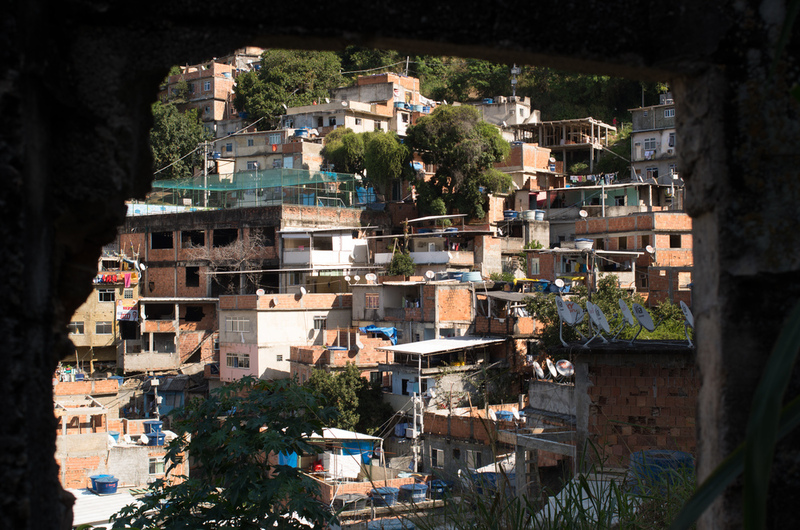 Ladeira dos Tabajaras is an uncommon favela - the disorder and chaotic atmosphere is nothing particular, but it is placed in the heart of Copacabana, one of richest neighborhoods in Rio de Janeiro. The characteristic unfinished houses contrasts with a lot of expensive TV satellite dishes. Márcia is the heath agent, responsible for a group of families in Tabajaras. She has been doing this work for years, since the beginning of the health care assistance program. She has a very close relationship with the residents. 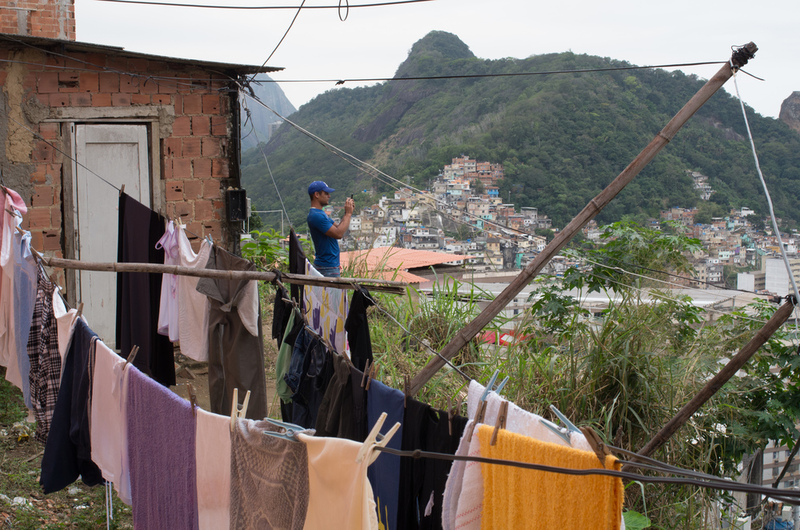 Rio de Janeiro is a city of contrasts: among photogenic landscapes like the Sugar Loaf, there are hidden areas where poverty and inequalities exist. They are much closer than we can imagine. Márcia was born in Tabajaras. She still lives and works in the same area, which makes her very popular among the residents. A man looks over the favela. Some of the best views in Rio are located in the higher parts of favelas, and some of them have become tourist attractions. Health agents walk from house to house, collecting and providing informations, delivering supplies and examining patients' health status. Cássia, a new resident of Tabajaras at her home. She got a Hepatitis C diagnosis about 2 years ago, she used to work as a manicure and manipulate the instruments of several clients, the probable cause of infection. Born in Tabajaras, Marcia has lived here her whole life. “My grandmother came here when she was young,” she says. “My mother was born and raised here.” When she reaches the houses at the top of the stone steps, a green metal door swings open, releasing a small pack of dogs, yapping and barking to greet her. An elderly woman in a yellow cardigan appears in the doorway. She walks over to Marcia and they embrace. “She knows my family, my mother,” Marcia explains. “My aunt is the same age as her.” Marcia smiles affectionately at her friend, patting her on the arm as they chat briefly. Marcia’s status as a local isn’t the only reason she’s so popular around Tabajaras. As her shirt announces to all who encounter her, Marcia is an agent communitario de saude – a community health agent, an integral part of public health services in Tabajaras. In poor communities around Rio de Janeiro, residents’ primary health care comes in the form of the Family Health Strategy. Part of the state’s Unified Medical System (SUS), the Family Health Strategy provides services to specific neighborhoods and communities, with a small group of medical professionals responsible for the medical needs in each one. Each medical team consists of a general practitioner, a nurse, a nurse’s assistant, and an oral surgery team, along with six community health agents. All the agents come from the communities they serve. It is this feature that makes the program special: rather than have people come to the clinic, the agents bring primary health care to the patients’ homes. Part of the government’s effort to expand access to public health to communities with poor access to medical services, the Family Health Strategy is responsible for one hundred percent of Tabajaras’ residents having access to primary healthcare. But the fledgling public health system in Brazil still does not have the capacity to handle the needs of the whole population. The agents work in shifts, one in the morning and one in the afternoon. They must visit a minimum of six patients during their rounds. Normally, Marcia does her visits alone, but today Andressa Balsan, a nurse from the clinic, accompanies her on her afternoon shift. 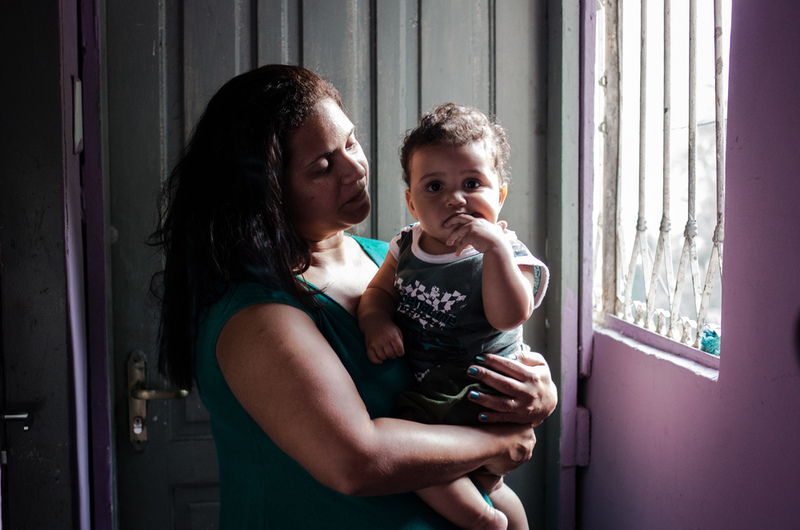 One of Marcia’s patients is Cassia, a mother of three who has hepatitis C. In Brazil, hepatitis C is a full-fledged epidemic; over 1.5 million people are infected. In Rio alone there are thought to be over 110,000 cases—or 1.8 percent of the population—though more than 90 percent of cases are believed to be undiagnosed. Most people who contract the virus are unaware of the disease living inside them, as the hepatitis C virus can live inside of a host for years before exhibiting symptoms. Approximately 80 percent of hepatitis C cases will not manifest symptoms until the onset of liver failure. The three women meet outside Cassia’s flat, a cramped apartment consisting of two rooms. Marcia introduces Andressa to Cassia, who had recently moved from another medical jurisdiction. Cassia and Marcia met only once before, when the former registered for medical care. “About the hepatitis?” Cassia asks. Cassia most likely contracted the disease while working as a manicurist at a beauty salon. Unlike HIV, which cannot survive outside of a host’s body, HCV is a very resilient virus; it can stay alive and highly contagious for up to four days outside of a host. “At the time I thought I was going to die,” she remembers. “I was terrified. It was awful news, even worse because I was pregnant.” But when she went to follow up with a specialist at the University Hospital Gafrée e Guinle, her tests indicated that she had a low viral load. And each subsequent test indicated the same thing. Cassia decided to abandon the treatment, feeling confident that she was healthy and reluctant to make the long, inconvenient trip from Tabajaras to the hospital. But during her third pregnancy, the virus appeared again in her blood work. “I thought, ‘I can’t believe it, I can’t accept it,’” says Cassia. “I was going to give birth in one week.” Her doctors told her to have the baby, and then follow up for exams after he was born. And that’s just what she did, six months after the birth of her son. “I received the results today,” Cassia tells them. Just then, Cassia’s nine month-old son appears next to his mother, his brown locks rubbing against her leg. A small dribble of saliva rolls down his chubby cheeks. He claws at his mother with his tiny fingers, trying to get her attention. Cássia, a new resident of Tabajaras, in her home. She got diagnosed for Hepatitis C 2 years ago. She used to work as a manicurist, manipulating the instruments of several clients - the probable cause of infection. Cássia received good news through exams results: the viral load is under the disease standard. She still needs to test again in few months to confirm the regression of the Hepatitis. Cássia with her younger son. Pregnancy was a vital point in Cássia's life. She discovered the disease during routine exams and transmitting the virus to her son became the biggest concern. They hope for better days to come. The three sit down on a leopard print couch, Antonia sandwiched between the two visitors. Marcia takes a clipboard out of her backpack and begins asking her patient questions while the nurse measures her blood pressure. “Have you started your diet?” she asks. “Yes,” Antonia replies in her tinny rasp. “Are you sure?” Marcia asks knowingly, a smile on her face. “There is no diet at all,” she admits, chuckling. “It’s because I didn’t take the medicine,” she admits again, tittering like a guilty child. “She’s a rebel,” Marcia exclaims. “Do you want us to come here and feed it to you?” Marcia’s patients trust her enough to be honest with her. As a community agent, it is her job to make them feel comfortable talking about their personal lives, to discuss their problems, to tell the truth about what they are going through. That is why she is so effective. Up the hill, a group of young boys are playing soccer on an outdoor concrete court, painted blue with yellow and white lines. Empty steel frames serve as nets. One of the kids kicks the ball and it bounces off the crossbeam into the air, caught by a green net that covers the open space. The soccer court is part of an unfinished project to build a sports center in the favela. Below, the structure is empty, with bits of rubble and trash heaped up a large pile of dirt. “The structure is suffering the passage of time,” says Douglas, age 26. He is standing on the side of the court, smoking a cigarette and shouting encouragements to the kids. Sandra Guimaraes de Almeida is another of Marcia’s patients. She lives with her fiancée Rogerio in a one room apartment, part of a larger tenement structure they share with five other families. Rogerio is sick, lying on a mattress on the floor below the television, wrapped in a zebra-print blanket. Standing in their tiny kitchen, Sandra is tidying up and preparing tea. Márcia works hard to be an integral part of the patients' everyday life. While her relationship is professional, the care and interaction are key points of primary heath. Sandra and Rodrigo, a couple who became stronger in order to overcome the difficulties of treating Sandra's Hepatitis C. They embrace each other in their home at Ladeira dos Tabajaras. Tabajaras is a community under development while poverty rate in Brazil is slowly decreasing. Márcia is part of a major point in this change, with the goal to achieve universal health care access. Márcia says that she's a health agent 24 hours a day. The health agents are the face of the health system for the residents. The clinic that serves Tabajaras is in the heart of Copacabana, right next to the Siqueira Campos metro station. More than 100,000 people receive treatment there, though the Family Health Strategy only covers between twenty and thirty thousand. The goal is to expand coverage to the entire area, but priority is given to those communities that need the program most, like Tabajaras. In the case of a disease like hepatitis C, which does not manifest symptoms until it has progressed to a life-threatening state, this leaves room for error.